The Law Office of Doug Goyen does not represent "property damage only" cases. The Law Office of Doug Goyen represents people who have been injured in accidents, including helping the with their property damage on their automobile as part of our representation of your injury claim. Typically this is not the area that is in dispute in a personal injury case, but sometimes it can be part of what is disputed. What are the rules with regard to getting my vehicle fixed (property damage), what is the insurance to repair a vehicle? It depends, if you can show the other person is at fault in the collision, and there is no dispute regarding liability, you can go through the other driver’s auto insurance (if he has any). Collision Insurance: Usually a deductible is involved with collision insurance to repair a vehicle, somewhere between $100 to $500 depending on your policy. This applies to any collision type incident, whether you are at fault or not at fault, you can use this insurance to repair a vehicle damaged from the collision. Comprehensive Insurance: Theft, vandalism, weather damage, hail, etc., these types of damage to your vehicle are all covered by your comprehensive insurance coverage. Usually there is a deductible you are required to pay for comprehensive insurance claims - typically anywhere from $100 - $500, depending on your policy. 1) What if the other driver is uninsured? If the other driver is uninsured, you can then go through your uninsured motorist property damage insurance to repair a vehicle. In Texas there is a $250.00 deductible for uninsured motorist property damage claims. 2) What if it was a hit and run? If there was a hit and run involved – and you do not have any information on the other vehicle, then you MUST make a police report in order to collect under uninsured motorist property damage insurance. 3) What if I don’t have uninsured motorist coverage for my car? If the other driver does not have insurance and cannot pay for the damage to your vehicle, or it is a hit and run and you have no information on the person at fault for the damage to your car, your only other option will be to use your own collision coverage. Your auto insurer will charge your deductible to fix your vehicle, and then they will attempt to collect against the uninsured driver (if their information is known). If you only have liability coverage and don’t have collision coverage or uninsured motorist coverage, or if you are uninsured, and the at fault driver is uninsured, then you will not have an insurance claim you can make for your property damage. If you have the information on the other driver, you may be able to convince them to pay for the damage they did to your vehicle, but this is usually not successful because most people don’t have the amount of money needed to pay for repair costs from a collision (this is why insurance is required – unfortunately, not everyone follows the rules, and is why you should always protect yourself with uninsured motorist coverage). 4) Repairable – If vehicle is repairable – need estimate. When You Start Repairs: If your vehicle is repairable, and you have an insurance company (either the other driver’s liability insurance, or your own collision coverage or uninsured motorist insurance) then you need to have an estimate done on the damage to your vehicle. When you have determined which insurance company is going to pay for the repairs, you can take the vehicle wherever you want to have it repaired. You are not required to take your vehicle to the shop that the insurance company recommends, unless you want to take it to that shop. How the Estimate works: Once the insurance company writes an estimate – and has agreed to pay for the repair, you take your vehicle to the shop of your choice, give them a copy of the repair estimate, and the shop will start work on the vehicle based on the repair estimate. If the shop determines that the estimate is too low, they will call the insurance company to come back out and do a “supplement”. A supplement estimate is done when the vehicle has been taken apart, and additional damage has been discovered or confirmed. Most property damage claims have supplements, they are very common and usually not much to be concerned about. 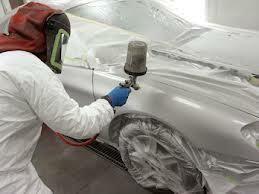 VERY IMPORTANT: Once the body shop indicates the repairs are complete, be sure to look over your vehicle. Do not give them your property damage check (the check given to you by the insurance company) until you are satisfied with the repairs. THIS IS YOUR ONLY LEVERAGE. If you give them the check up front, you have no leverage to ensure that they do the repairs the way you want them to be done. If you keep the check until the repairs have been completed to your satisfaction, then when you look at the vehicle and see something is out of alignment, or not the correct color, or done poorly, you can insist the correct the problem . . . or you won’t sign the check over to them until they do the repairs correctly. 5) Total Loss – What is the Definition of a Total Loss? Collision Coverage definition of Total Loss: If you are going through your own insurance policy under your collision coverage – you are bound by contractual terms as to what the insurance company considers a total loss. Insurance companies define a total loss – when the cost to repair the property is more than the “actual cash value of the damaged property” then it is a “total loss”. If you are collecting under your own insurance coverage – then if the repair cost is more than the value of the property, your insurance company will consider your vehicle a “total loss” and only pay the value of the vehicle – and take possession of that vehicle. If Collecting under Liability Insurance of Other Driver: The legal definition of a “total loss” is that the property is not repairable. Just because the cost to repair the vehicle may be as much as the vehicle is worth does not make it a total loss if you are going against the other person’s insurance. This is because you do not have a contract with them, and are not bound by their contractual terms. You are only bound by what the “law” says a total loss is – and the law considers property a total loss if it is not repairable. Rental Car: Insurance Company will not pay for a rental car if you agree that your vehicle is a “total loss”: If you are going against the other driver’s insurance, and you have rental car bills, if your vehicle is repairable, even if it would cost more to repair than the vehicle is worth, you may want to insist on the money to repair the vehicle and gather the evidence from an independent body shop that the vehicle can be repaired, and at what price the repair can be done. This is because you can then still collect your rental car bill. Insurance companies love to use the “technicality” that your vehicle is a “total loss” therefore they are not required to pay for your rental car bill. This is a technicality in the law. A bad part of the law, but still, part of the law. The only way to defeat this sneaky way insurance companies try to use to avoid paying your rental car bill is for you to insist that your vehicle is NOT a total loss, and you want the money to repair your vehicle, and you also want the money for your rental car bill. When going against the other driver’s liability insurance – you are entitled to the “loss of use” of your vehicle. Typically this means the amount it cost you for your rental vehicle while your vehicle was not driveable. Keep in mind, you must “mitigate” your damages. Mitigate means to keep your damages to a minimal amount. You cannot just stay in your rental without keeping on top of the body shop, ensuring that they are actually doing the repairs, and not just sitting on the vehicle for some reason. You cannot delay in getting your vehicle to a shop for repair – once you have received payment or have some other reasonable means to start repairs. a) Rental Car – If you are driving a small economy sized vehicle, like a Camry, you must rent a similar type vehicle if you want to be reimbursed for the cost of the rental. You cannot go out and rent a Hummer and expect to be reimbursed – if your car you own is a Camry. Additionally, you need to price out the cost of renting from a few different rental car companies and get a reasonable price. You can’t expect the insurance company to pay for the highest bidder out there. Make a few calls to a few different places, then call the insurance company to inform them of what you have found. Ask them if they have any recommendations of places with better prices. Direct Bill: Most insurance companies will set up a “direct bill” with the rental car company while your vehicle is being repaired. This way the insurance company has some control over the cost and time you are in the rental car. This is also typically most convenient for you, since you don’t have to pay the bill up front and then haggle with the insurance company about reimbursing you for your expenses. If they accept the direct bill, they accept the bill themselves. BE CAREFUL about the extra insurance coverage that the rental car companies try to sell you. The automobile insurance company usually won’t pay for that under the Direct Bill agreement, because if you have your own liability insurance, it covers a temporary replacement vehicle while your vehicle is being repaired, and therefore there is no need for the extra insurance coverage. Dealing with the rental car company: Be sure to take photos of the rental car with your phone - especially if there are any bumps or dings on the vehicle when you are picking it up. I cannot tell you how many times people have told me that the rental car company blamed damage to the rental car on the renter, when the renter swears that no damage was done while they had the vehicle. If you have photos of the vehicle both when you pick up the vehicle, and when you turn it in, you will have evidence of the condition of the vehicle. Dealing with rental car companies can be easy, but like many of us know, it can also be frustrating at times. What if you don’t get a rental car, but you are without your car for several weeks? In this situation, the law still allows you to recover for your “loss of use”. Typically this is calculated by the amount a rental car would have cost you had you been able to rent one. The Texas Supreme Court case that talks about this situation is LUNA v. NORTH STAR DODGE SALES, INC., 667 S.W.2d 115 (1984). The Supreme Court says very clearly in this case that you are not required to rent a vehicle to recover for the “loss of use” of your vehicle. c) How Total Loss Affects Rental Car – Remember, if you agree that your car is a total loss, you get no money for loss of use. See #5 above – Total Loss for discussion of this issue.